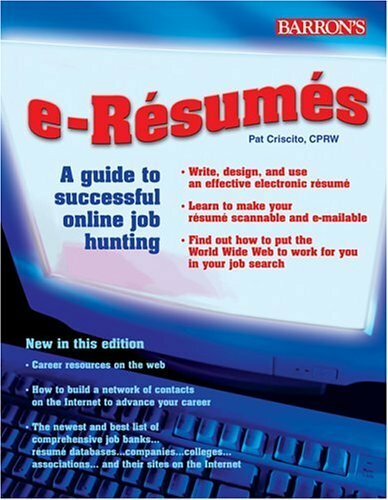 Originally titled Résumés in Cyberspace, this new edition describes the latest trends in job hunting and career development opportunities via the Web. You’ll discover how to create the perfect electronic résumé, and then send it virtually anywhere in the world from your home computer. Just as important, you’ll find an up-to-date and streamlined list of web sites that accept e-résumés and offer jobs online. But e-Résumés is much more than a “link book.” It gives you the “how-to” of résumé design and writing, then teaches you how to take full advantage of the Internet. One brand-new chapter will also teach you how to create and use an e-portfolio in your job search. Another will provide you with everything you need to know about how to use the Internet as a networking tool. To order an autographed copy of this book call (800) 446-2408.